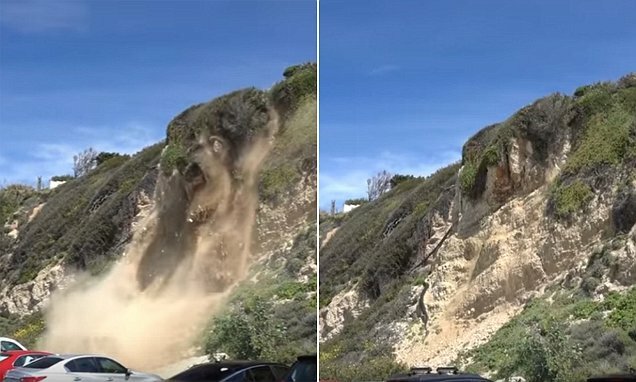 Dust and rubble filled the air after the 'dirt waterfall' near Zuma Beach in Malibu, California. At first there is a trickle of dust falling off the mountain like a stream. Could you please update to the latest version of Brave and let us know if this is still an issue? If so, please provide information as per the post below so we can better assist. time of the report was the one having the problem. so will have to send you 3 more emails. Hope this will help you figure out what is crashing it. Even the home page and the base news url will crash in the same fashion. upgrade to HTTPS is what is blowing it up. @larryl 0.17.3 is a preview (not stable) build. Where did you get it from? when you tell me an update is available, I update to that new version. stable and ready for prime time. browsers every time I have tried for the last several versions. its blocking and https upgrades the window just goes away! No error! no warning! Just window disappears. Something dailymail does really pisses off your browser. @larryl thanks for following up! When Lauren asked you to update a day ago, did you get that from github? You are correct, we do not announce until it’s ready. We do have a new preview updater, but that’s for testing. I tried a lot of dailymail links on my windows 32bit VM and still couldn’t reproduce, so I have one last thing I’d like for you to test out if you’re up for it. Could you quit Brave first, then rename the brave folder in %appdata% to something else? After you launch visit dailymail and try a few links. I suspect something in your profile has gone a bit haywire. all three of the above links with no crashes. between the old profile and the recreated one? @larryl if you felt like zipping up that folder and mailing it to alex@brave.com that’d be super nice of you. Thanks! Glad to hear that resetting your profile worked.